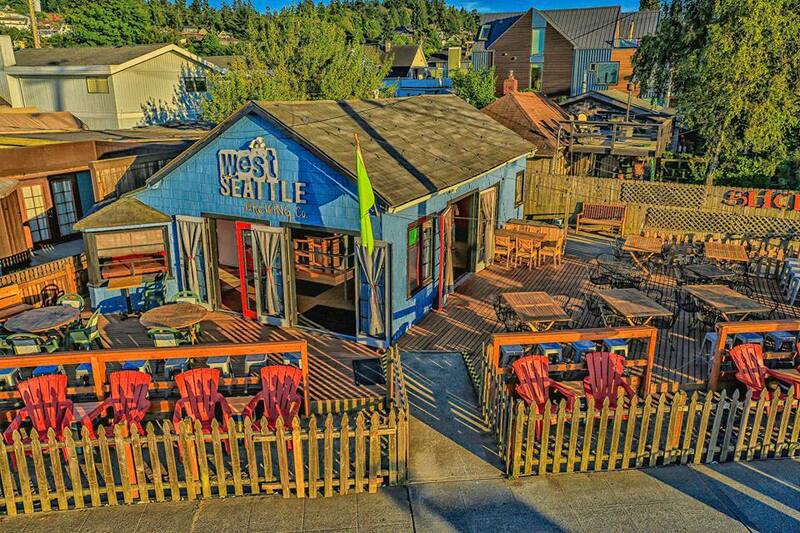 Last week, West Seattle Brewing Co. opened its bright blue tap shack on Marine Avenue and joined the league of sun-soaked patios. Owner Drew Locke moved into the former digs of Slices and carries on the tradition of pizza. It certainly helps that the equipment was still there, says Locke. They won’t be serving pizza by the slice, but rather in ten inch pies; from classic takes to one with a white cream sauce base and topped with spinach and smoked oysters. The beer of course is brewed a breezy ten minutes away at West Seattle Brewing’s location on Fauntleroy Way. On their seven taps here: Alki Lumber lager, Avalon amber ale, Sounders stout, Belgian golden ale, House IPA, Road Rage rye, and a Belgian wit-style beer. An eighth tap dispenses a dry cider from 6 Cider Company. And more brews are on deck such as a pilsner, saison, tripel, pale ale, and a new India-style session ale. As for that beachside patio, there are around ten tables outside plus stools and chairs facing Puget Sound. Make friends with your sunscreen, folks. Fulfill your pizza, patio, and beering needs at 2600 Marine Avenue SW, with daily hours from noon to 11pm. For updates, the West Seattle Brewing Co. Facebook page is your best bet.